This is how Wahkeena Falls ends up, right at your feet. Multnomah Falls at 189 meters in height. We wanted Voodoo doughnuts. We followed the GPS, but it seemed to be a bit confused by Portland. 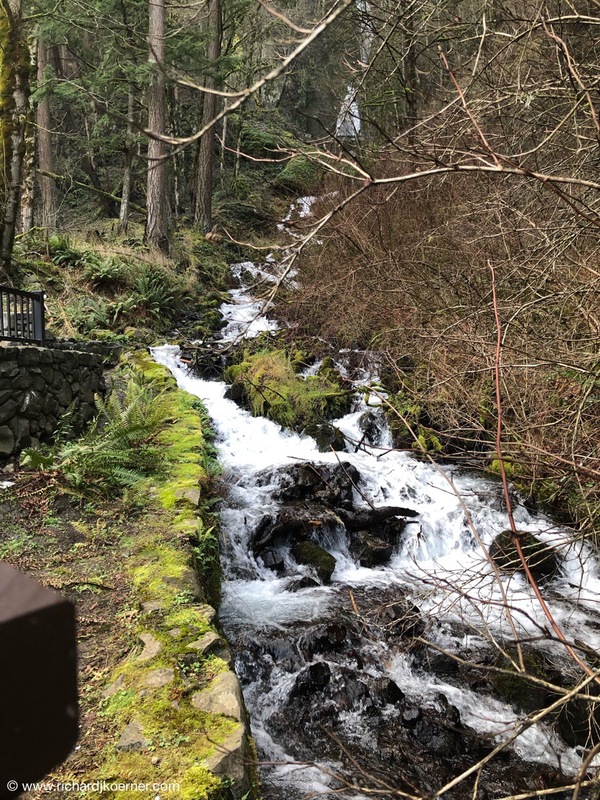 We were at the edge of the city, near the Willamette river, and since we had not found it, we decided to head out to Multnomah falls, near the Columbia River. 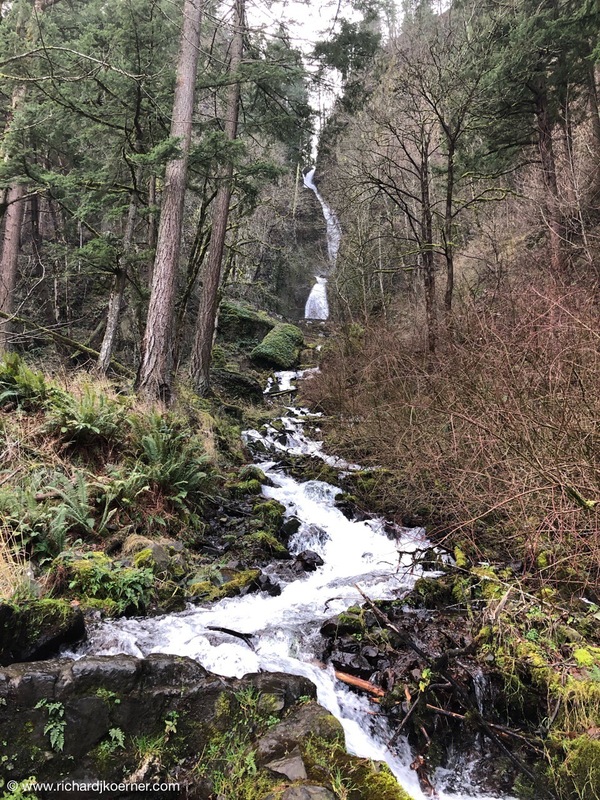 We first stopped at Wahkeena Falls, a noisy amazing cascade of water down a huge cliff facing the Columbia river, and ending up in a very loud, bubbling and gurgling stream. 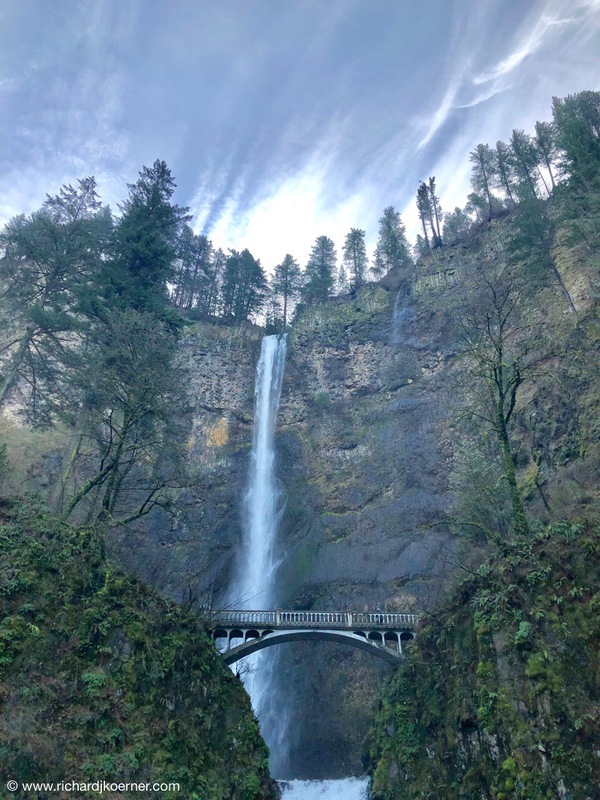 A bit down the road, we discovered Multnomah Falls, an amazing cascade of water, the tallest in Oregon at 620 feet in height, that is quite well known. Strangely enough, there was an old lodge there with a restaurant, so we had a most wonderful breakfast there with marionberries and French toast for me and trout and eggs for MK. We were able to see the falls through the glass walls of the add-on room to the lodge. It was spectacular. After our view of the falls and enjoying the beauty of nature, not to mention the beautiful trek east through the land along the river, we went back to Portland. 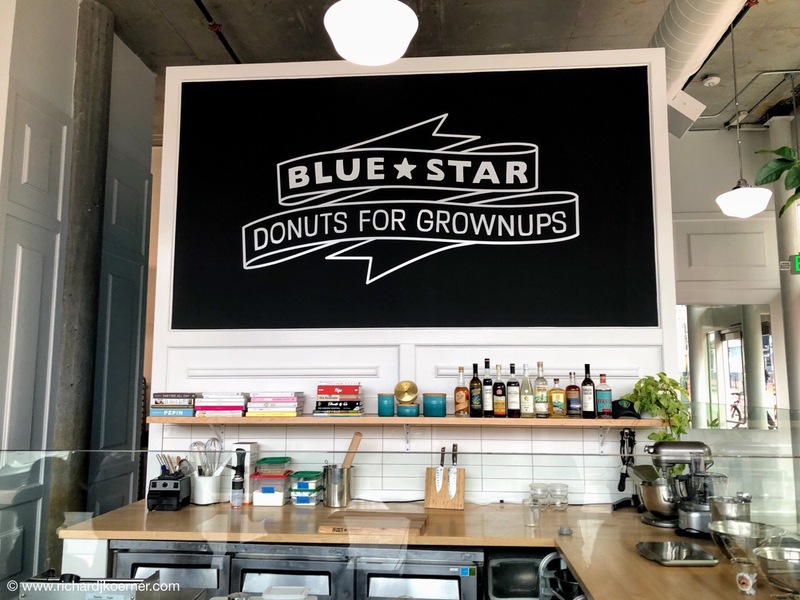 There we did a bit of a walking tour, finding Pioneer Square, right near our hotel, and then Blue Star doughnuts, considered to be a finer quality doughnut by people we spoke to, than the Voodoo doughnuts. They were delicious. 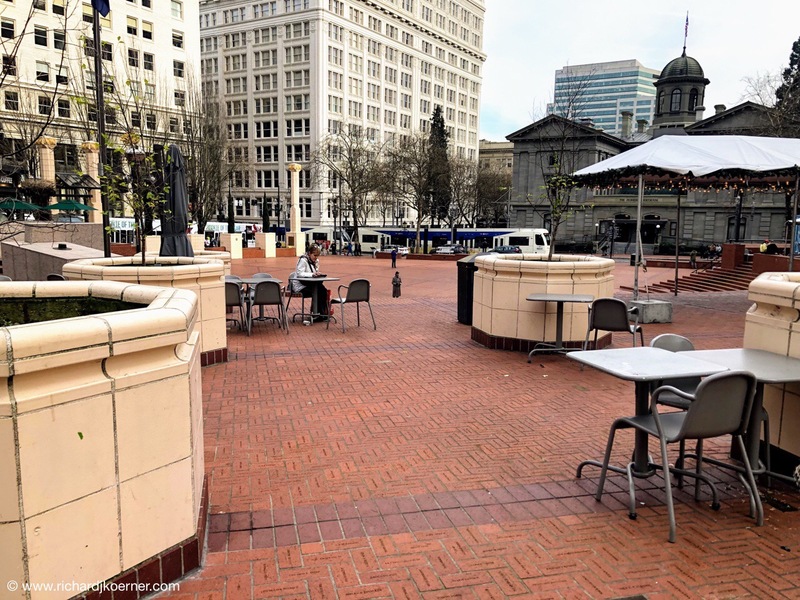 We continued our walk in Portland and ended up in Powell’s Bookstore. It is an awesome location to find books, taking up a full city block. I had been here before, but it is quite the impressive place to be. We were not in the mood for book purchasing, having come with luggage that was only carry on. But as I soon found out, although we only had carry-ons, for ease of travel, we would have to check them for our return trip, one of the many reasons I now have a vendetta against United Airlines. We then walked back to our hotel, and did the decadent thing of reading our books, mine being on my iPad. Perhaps we should have done that at Powell’s. Dinner was at a wonderful Italian place, Osteria Mucca, which turned out to be wonderful. It could not have been better.